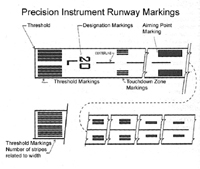 What determines runway designations? Since aircraft are very much affected by wind during takeoffs and landings, runway direction and placement is very important. If there is only one runway, then it is built to align with the most prevailing wind. If other runways are built then those runways are built to align with other common wind directions. The numbers you see on the runway correspond to a magnetic north reference. The runway's magnetic direction is then rounded off to the nearest 10 degrees. For example, if the runway's magnetic heading is 183 degrees, then it would be rounded off to 180 degrees and would be referred to as "runway one-eight". You would see "18" painted on the runway. The other end of the runway, coming from the exact opposite direction, would be runway 36, "runway three-six". A runway with a magnetic heading of 067 degrees would be runway 07, "runway zero-seven". To simplify runway numbers, any runway that has a magnetic heading between 010 degrees and 090 degrees is designated with a single number. You would see "7" painted on the runway and would also be referred to as "runway seven". At many airports, especially large ones, you will see parallel runways. This can be just one more parallel, or four and more! If there is just one more parallel runway, than these two parallel runways will be designated with a "L" for the left runway, and a "R" for the right. The left and right is in reference to the direction you are landing or taking off. For example, if the runways are 180 degrees, than we could be using either "runway one-eight left" or "one-eight right" for runway designations. If there are three parallel runways, then the runway in the middle would be designated with a "C" for center. Therefore, we could be using "runway one-eight left", "runway one-eight right", or "runway one-eight center". If there are four parallel runways, then the runways would be divided into two sets of parallel runways. The first set would usually be the main runways (or first built) rounded to the nearest 10 degrees as cited above. The next set of two would be rounded to the next nearest 10 degrees. For example, we could have runway designations of 17L, 17R, and 18L, 18R.